The new training environment portal. The OneUniversity Finance training environment has been updated and is now live. Based on feedback we’ve received at our training sessions, we’ve added transactional and budget data to reflect the information which will be available once the system is live. This means that the training environment will be as similar to the live system as possible. Stuart Moorhouse, Business Transformation project manager, said: “It’s a major milestone for the Programme and for our teams in the Schools and Directorates which is reflective of the hard work and effort which has gone into it. 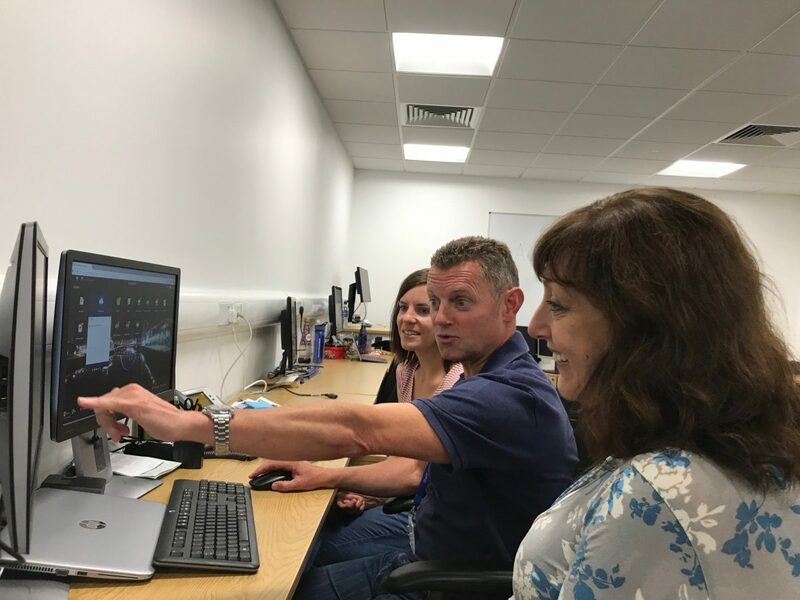 The new training environment provides a great opportunity for staff to find out how the system works and get hands-on experience using real data”. Why have we launched a training environment? The main benefit of having the training system available before the live system is launched is the opportunity for staff to practice their day-to-day activities in a safe and secure environment. This means staff can ‘hit the ground running’ on tasks when OneUniversity Finance is live. What data / configuration is available? All user profiles and roles as well as transactional data for the 2017/2018 financial year plus periods 1-5 for the 2018/2019 financial year. A selection of reports, workflows, processes, budgets, forecasting and year-end balances will all be available. Our Knowledge Base has a comprehensive list of Q&As. We also have training materials on Blackboard and in the all-staff folder in Box. Further training on the new system will be scheduled and communicated through our usual channels including the Business Transformation website. We’ll continue to keep you updated on any issues or news relating to the training environment and our business-readiness activities as we move forward with the Programme. We’d welcome any feedback, suggestions or queries you may have. Please email the BT team. With the launch of OneUniversity we’re implementing a ‘No PO No Pay’ policy. 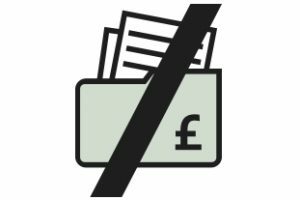 This means that all invoices from suppliers must quote a valid OneUniversity Purchase Order (PO) number. There are some exceptions to this policy where a PO is not appropriate for the type of supplier or transaction. There is a perception that it’s impossible to raise a purchase order for a requirement unless a final price is known and that the final price is only known when the invoice has been received. This would make budget management in the University extremely difficult given that there will be no commitment on the finance system prior to the invoice being received. Also, it doesn’t allow the University to establish the terms of the agreement with the supplier for scope of work, terms and conditions, etc. Ensure the amount on the PO is based on a realistic estimate. → Ensures that purchases are authorised before goods, services and works are supplied. → Enables the University to process invoices efficiently, ensuring a positive payment profile with suppliers/contractors. → Enables accurate timely reporting, budgeting and forecasting across the University. → Reduces risk to the University by formally agreeing the terms, conditions and deliverables before the supplier/contractor begins any work. Invoices received with a valid OneUniversity PO number will be processed as normal by Accounts Payable. Invoices received without a valid OneUniversity PO number will be returned to the supplier until a valid PO number can be provided and the invoice is resubmitted. → Don’t commit University funds without raising a PO first. → Use a University approved supplier in compliance with the Procurement Policy. → When raising an appropriate requisition, obtain approval and communicate the OneUniversity PO number to the supplier/contractor. The Programme has explored the possibility of using the delegations functionality within One University. Due to the nature of an integrated system, the addition of modules such as Human Resources gives the potential for inappropriate access to sensitive information. We’re pleased to announce that the winner of the Digital Dexterity competition is Amy Pass from the Development and Alumni Relations Office (DARO). Amy made an expense claim on her mobile phone in just over a minute – 01:04 to be precise. Her flexible fingers beat off stiff competition from her own colleagues at DARO and External Relations who took nine out of the 10 top spots on our leader board. There must be something in their water cooler. Amy was delighted to win a £30 Amazon voucher. From the go-live date on 1 November everyone will be responsible for completing their own expenses in OneUniversity. If you haven’t used the system yet, come along to one of our Expenses drop-in surgeries between 6 September and 18 October. You can view the sessions on the Business Transformation website. You can try out claiming an expense on OneUniversity right now on a computer, tablet or mobile in our Train environment. Have a look at our self-service training materials and give it a go. Author Joanna StephensPosted on 3rd September 2018 14th September 2018 Categories Finance and Procurement, UncategorisedTags amy pass, DAROLeave a comment on We have a winner! We use testing to ensure that all the components of the new OneUniversity solution for Finance and Procurement function as we expect them to. The University supplies a list of requirements called acceptance criteria and we test against these standards. There’s a wide variety of people involved in testing – business process change managers, business analysts, professional support staff, change champions and Finance subject matter experts (SMEs). Finance project manager, Stuart Moorhouse, said: “We’ve conducted a very thorough programme of testing with different groups of people across the Business. This is vital to the success of delivering the Finance and Procurement function of the OneUniversity solution”. When will Finance go live? This is a question we’re often asked when out and about, and the simple answer is, only when we’ve completed testing and the system meets the requirements of the business. 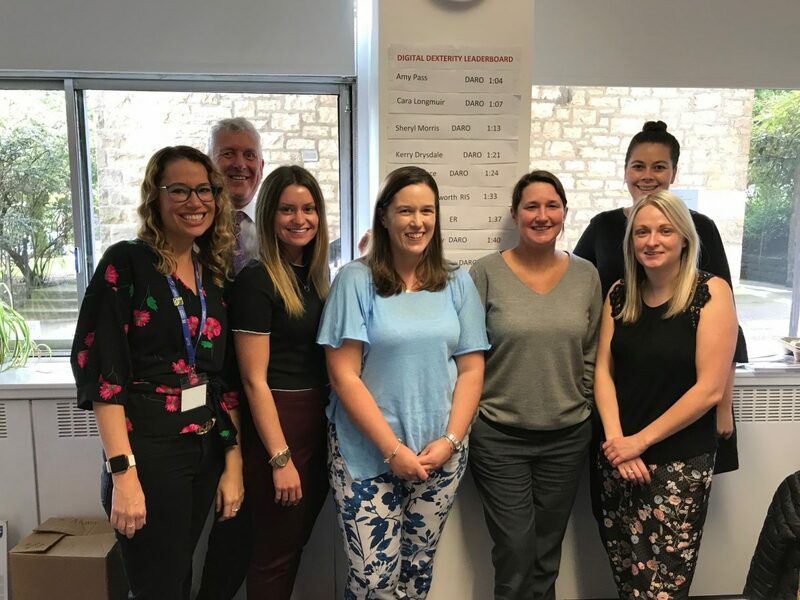 The Business Transformation training team has been supporting the Finance and Procurement workstream to deliver key-user and end-user training. We’ve been offering hands-on workshops and drop-in sessions underpinned by a suite of online training materials. Key users are subject matter experts working on the Programme at a workstream level, or those closely involved in the shaping and delivery of the OneUniversity solution. How do we support the workstreams? All University staff and students will use OneUniversity so we’re all end users. The Change and Communications team will deliver end-user training and any other activity associated with helping to prepare our people for the transformation OneUniversity will bring. 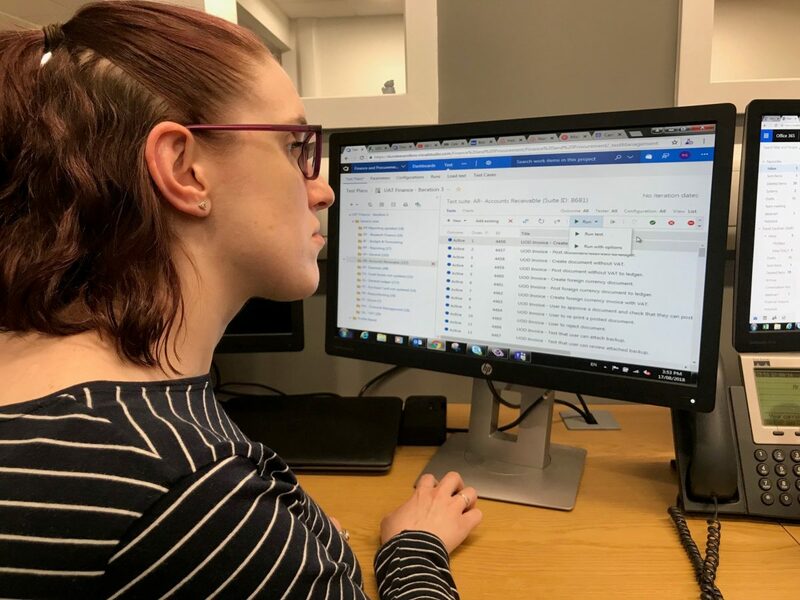 Our objectives are to equip people with the knowledge, skills and abilities to do their jobs from day one and support them as they transition to using new, shared processes and databases. We now have a dedicated training officer, Chris Reid, and administrator, Emma McDade, who you’ll meet when you attend a session. You can contact the training team on 388081. 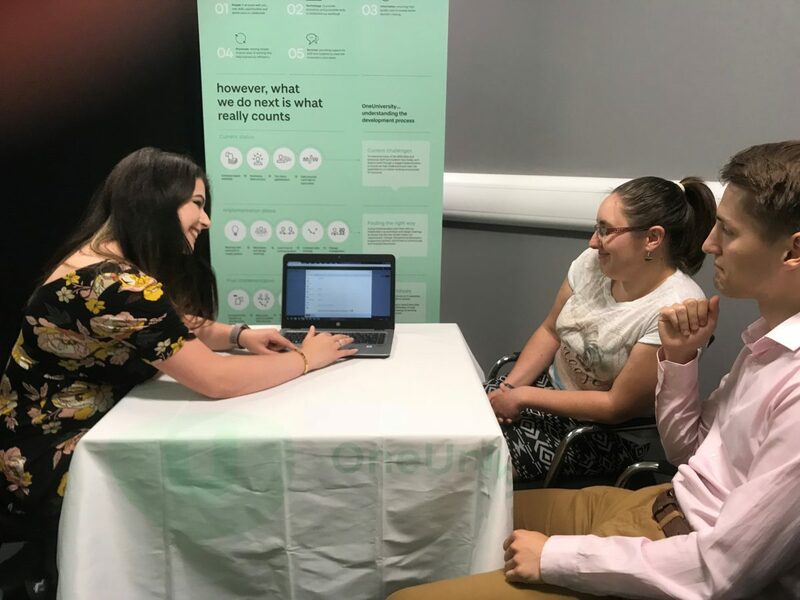 At the end of June, the Business Transformation Training team, Chris Reid and Emma McDade, ran drop-in sessions in the Tower and at Life Sciences to showcase the new Travel and Expenses functionality in OneUniversity. Chris was pleased to see how well the day went. 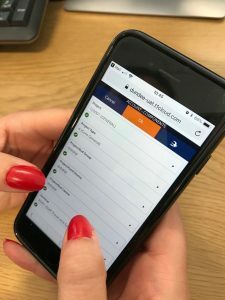 He said: “Our sessions were very positively received, which was great news, and users were happy to see the system in action and how easy it was to submit a claim. It’s great that expenses can be done ‘on the go’ and allows for quicker submissions, which means no more paper jams! “Moving forward, we’re going to run several more of these sessions which we’re really looking forward to. We’ve also recorded any questions that were asked and they’ll be available along with responses in the Help4U Knowledge Base.” You can login here. The next drop-in session is at Ninewells on 12 July in Teaching Room 4 from 9:30am to 10:30am with further sessions being planned. There are also drop-in sessions for one to one or small groups who would like to see demonstrations of the Travel and Expenses function on Thursday 19 July 10.00 -11.00 (Dalhousie 2G13) and Tuesday 24 July 14.00-15.00 (Dalhousie 2F11). No need to book, just turn up. Our change champions are an integral part of our change programme. In this blog we speak to Letty Gibson, Research School Services Manager, School of Life Sciences, about her role as a change champion. 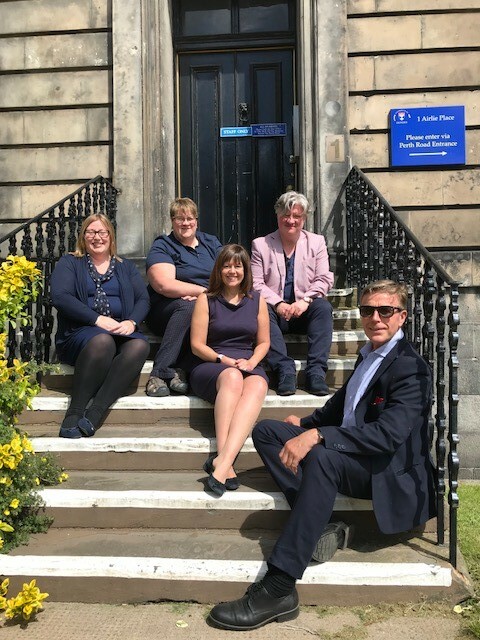 I have been employed by the University of Dundee in Life Sciences since 1997 and my role has changed several times during this time as the School has expanded. I am now the Research Technical Lead in Life Sciences within the senior management team. I’m also a member of various management committees across the university. Part of my role includes responsibility for the delivery of the Laboratory Management Support Service which includes a team of lab managers and junior lab technicians. Our work includes dealing with procurement, budget management, health and safety and compliance with legal requirements and adherence to UoD policy in all aspects. We focus on these areas so researchers can focus on their research activities. It’s very important to me, in fact, I’ve been involved in initial design workshops, user acceptance testing and training since before I became a change champion. From day one I’ve contributed to shaping and influencing the way Business Transformation will work. Procurement in Life Sciences is highly complex due to volume, range of funding bodies and types of spend. I’ve been fully involved to make sure the system can meet the procurement needs of Life Sciences regarding what we buy and where we buy it. But I carry out this work as part of a team, with lab managers and other key Life Science staff, who join me in workshops so we can get the best of their knowledge and expertise. From the beginning it was critical to me that our School should have a strong voice in the development stages of the Business Management System in order to influence. I’ve been involved in the introduction of new business systems in the School of Life Sciences before, namely in the development and launch of PECOS. Seeing the challenges that change brought, that’s where I learnt where potential obstacles can arise, what critical issues need to be addressed and what can be put in place to make change as seamless as possible. The key to success is preparation, planning and strong communication. That’s my role as liaison between the BT programme team and the staff within Life Sciences who will be affected by the change. Understanding and pre-empting what we will and won’t have is critical. I highlight our needs and identify if system solutions are in place and what will be available at go live. The smooth running of our labs during the cutover period is paramount and we do all we can not to compromise service delivery to staff. I’m very excited about the undertaking to improve business management processes. Currently we spend time looking for information and aren’t always able to access the data required, often duplicating our efforts and not being 100% sure that the information we have is current and accurate. I have been at many sessions where the data provided in the new system is described as a ‘single source of truth’. I’m really looking forward to this and it’ll be fantastic when managers can go and access the data they want instantly. I know that the grant holders are very excited when given an insight into the type of budget reporting that will be available and accessible using any device, anywhere. When the research model goes live it will have a huge impact on Life Sciences when researchers can trace a single pathway from idea to award. In HR too, to run my team of 25 people, it will be so useful to have a single source of information that’s easy, quick and efficient to access. Having simple access to complex data is going to help me do my job. I love driving but have never mastered reverse parking!